A wireless mouse that delivers a better mix of precision and comfort-with designed-for-Web scrolling. With up to 18 months of battery life, it's so hassle free you might just forget it runs on batteries. The $30 Logitech M325c Wireless Optical Mouse is fun and interesting looking, but the scroll wheel and sensor are a bit too touchy. Ambidextrous design. Vibrant color options. Unique back-and-forward clicking feature on the scroll wheel. Scroll wheel is a bit too sensitive. Might be too small for many hands. Making its presence felt in the UK, Reichelt Electronics has a range of competitively priced products including this next item under review. Logitech has recently introduced its M325 wireless mouse with 72 ratchets so you can scroll through more lines of content with a single flick on the scroll wheel. One unique Logitech mouse feature we are simply in love with is its micro-gear scrolling wheels, and the M325 is no exception. Though it doesn?t let you switch between Hyper-Gear and notched scrolling (for more on which, have a read of page two of our review), it instead combines the two. I have no complaints with this product. Easy to use, good design, great response and tactile feel, sized perfectly, the mouse wheel feels great and the battery life lasts a very long time. Definitely worth the price. The transition from a wired mouse to this one was awkward. I'm not sure why, but my movements were much less precise using this mouse, and I started to feel discomfort a couple days after I started using it. I think it has to do with how small the mouse is and how the weight is distributed. Have been a fan of Logitech mouse products for some time and this latest acquisition is no exception. Easy and comfortable to operate and very responsive. It is a little noisier than previous models I have used but this does not detract from its smooth and effortless operation. Highly recommended. This mouse works great. I have small hands and it's a great fit. Love the way it works with my Mac. Have had it for about a year and never needed to change the battery. Would purchase it again. Easy to set up and works great! The side clicking on the scrolling wheel comes in handy more than you think. They can be programmed from the software you download from Logitech's website. I had my old mouse for over five years and it was working great, but then someone stole it! That's the only reason I was in the market for a new mouse. I bought the exact same brand and style and am just as happy with it as I was my previous mouse. Logitech has the absolute best mice out there. Replaced it as its predecessor (same model) was showered with a sugared drink. So there you have it, this mouse can't handle black pops. 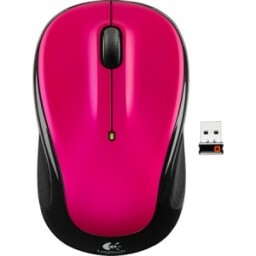 Other than that it's a reliable little mouse that's comfortable in your hand and features precise movements onscreen. Use primarily for personal use such as games, web browsing. Like the wheel. It does move on its own at times which is bothersome, but not terrible. Would prefer it to be smaller. They're a bit small, not the kind that you'd use all day long, but OK for light use. They work. They look like new. They only need 1 battery (AAA) No skipping, no lagging. No problems. They're not your larger size mouse. When the mouse arrived in the mail, I thought it would be too small for me to handle, but it is very comfortable in my hand. It is so much easier for me to use than the slim, sleek, multi-functional mouse I was using. There are no multi-functions to hit accidentally and make me crazy.